Former world champion Tanya Dubnicoff is taking a new role in Canadian track cycling, lending her wealth of knowledge to coach the Women's Team Pursuit squad. Dubnicoff is a registered Level IV coach in cycling, who has been coaching at the Home Depot Centre in Carson, a suburb of Los Angeles, in California. 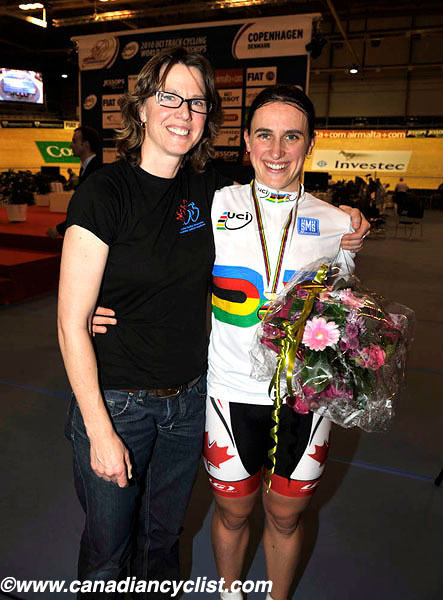 Dubnicoff, a three-time Olympian (1992 Barcelona, 1996 Atlanta, 2000 Sydney) who won four gold medals at Pan American Games, as well as the 1993 world Sprint title, will take the coaching leadership of Canada's Women Team Pursuit program alongside Head Coach Richard Wooles. The Women's Team Pursuit is a discipline where Canada is a strong contender for a medal at the 2012 OIympic Games in London, when the discipline will be contested for the first time at the Olympic Games. The team has been training in Carson. We spoke with Tanya in Calgary, where she was visiting before returning to California this week. Canadian Cyclist: So your base will remain in California? Tanya Dubnicoff: Yes, I will stay based in Los Angeles, it is our [the national track team] training base. CC: You've been doing some work with the national team for a while; when did you take a full-time, 'official' position with the national team, and what is your role? TD: It's been in the works for a while, and there were a lot of details to hash out, but we finally worked it all out over the [Christmas] holidays. I will be in charge of the women's team pursuit program. Richard [Wooles, national track coach] will still lead the overall track program, but some of the responsibilities in this program will be transferred to me. I think it is really great, but you also have to remember that I have already been with the team for a while; I still went to every World Cup and World Championships for the last two years. CC: The Team Pursuit squad seems to be really improving; they were on the podium in Beijing. TD: China was a huge success for the team; both the team pursuit and the whole national team. We just held a camp last week [in Los Angeles] for the team pursuit women, and brought five women into the camp - Clara Hughes, Alison Beveridge, Joelle Numainville, Jasmine Glaesser and Julia Bradley. It was a great time, we did some trials and gave everyone an opportunity to ride together. For the Worlds, this means that we could bring three or four riders, plus Tara [Whitten], and they could train together and allow us to select the best team on the day.